In today’s world of computer’s we have seen things go from Star Trek computers to laid out future workings. Computers are growing smaller as their intellect keeps getting bigger. Companies are finding new ways to gather information that will lead to a bigger or shall I say smaller better computer that millions of people will want to buy. 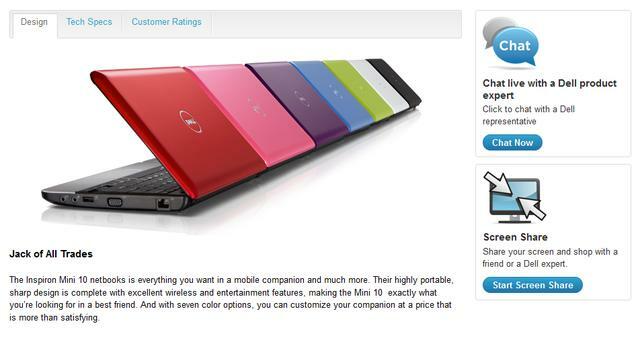 Now, Dell has done it again with the Netbook. This computer is packed with features, gizmos and thingamabobs. It has advanced technology that will sweep most fans off their feet, not to mention a great keyboard that is 92% the size of a traditional keyboard on a small portable frame that is no thicker than a deck of cards. I’m talking about the new Dell Mini 10V Netbook. The computer itself as a whole weighs 2.6lbs and displays a 10” seamless Hi-Def screen that plays movies just as well as any big TV that’s in your living room. It comes equipped with a HDMI port which means hooking up your TV, MP3 player, Playstation 3 or even your iPhone has never been easier. Enjoy a vast variety of wireless connections and built in Wi-Fi you will be surfing the net and checking e-mail in no time. A great built-in GPS navigation system lets you keep up with your destination and it works even when you do not have internet connection. You will never get lost as long as you have you netbook by your side. In fact it keeps better directions than your husband. The operating system is great with its ability to take on multiple ones when you can’t choose which one you want. First and foremost it comes standard with Microsoft Windows 7; however that can be traded for Windows Vista or even Windows XP Professional. If none of those intrigue your interest than Linux or Ubuntu can be installed, this computer is designed with your in mind which means you need to be completely satisfied and if you are not there are always options to change to get your full satisfaction. With 160 GB you will be able to upload 7,000 photos without deleting and you can also download 62,000 songs onto your Dell Mini 10V Netbook. You can choose from seven different colors such as red, black, green, blue, pink, purple, and white. 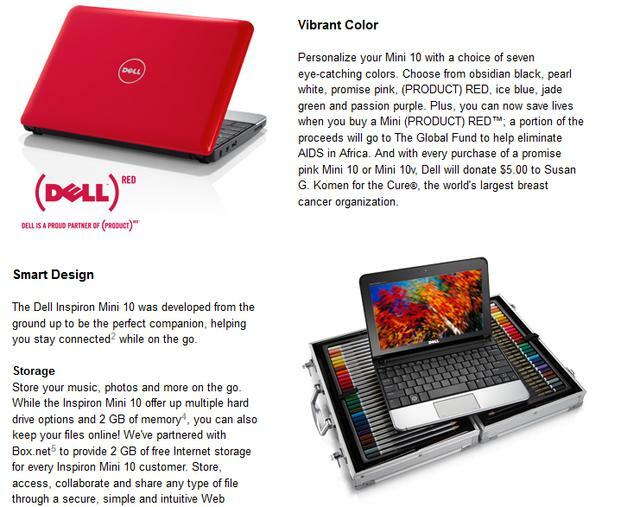 If you like an artist’s approach to design there are over 200 different artists designs located in the design studio of Dell’s website that will allow you to choose the exact art impression you want your Netbook to come with. One continuous problem a lot of people have when it comes to a portable computer in the battery, but with the Dell Mini 10V Netbook you won’t have any trouble. It comes standard with a lithium ion battery that lasts much longer than many other batteries do. So don’t worry about taking around a charger from place to place, charge it up and hit the road.